Hear ye, hear ye! Panini hath released it's most regal product of the year - Crown Royale! Known for its grandiose flair and special crown die-cut tops, Crown Royale is certainly a uniquely different type of card product. Last year's set was a very pleasant surprise - is this year's set still thee king of cards or has it stepped down from the throne? We'll find out as I review this new release. The Crown Royale base cards are a spectacular example of a great original idea that has pretty much stood the test of time. The original Crown Royale cards came out in the 90's with crown die-cuts, and still these cards appeal to collectors nearly 20 years later. 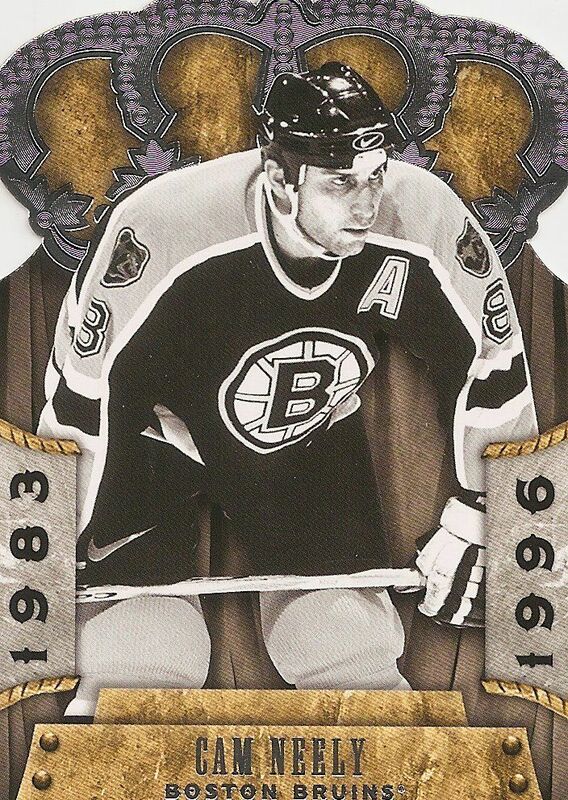 Obviously there is not a real tangible connection between ice-hockey or sports and the crown/royalty theme the set has, but for whatever reason, it just works... and it works well. The base cards feature two elements that make these cards stand out. 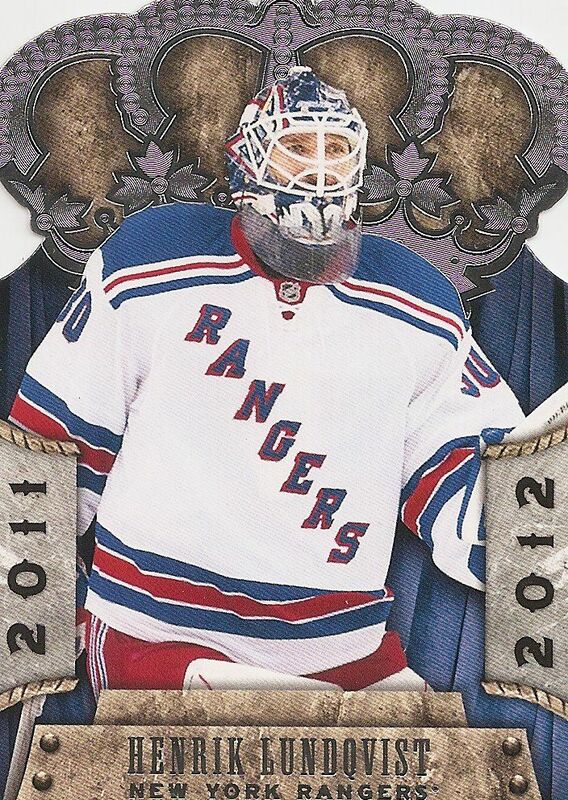 The first is obviously the foil crown that adorns the top of the card. There are generous amounts of foil used, and not just a flat layering of foil, but a textured foil that gives the crown a more three-dimensional feel. The next feature is the large, up-close photo of the player. The player image is very large, and in bold, bright color. Each player looks as if they are jumping right off the card. One other element of the card worth mentioning is the velvety background. I love how it subtly displays the team's color. Nice touch. There is not a lot of negative to say about the base card - just a couple of nit-pics. One is that the foil showing the player's name and team can be difficult to see in darker lighting because it blends in with the marble background. 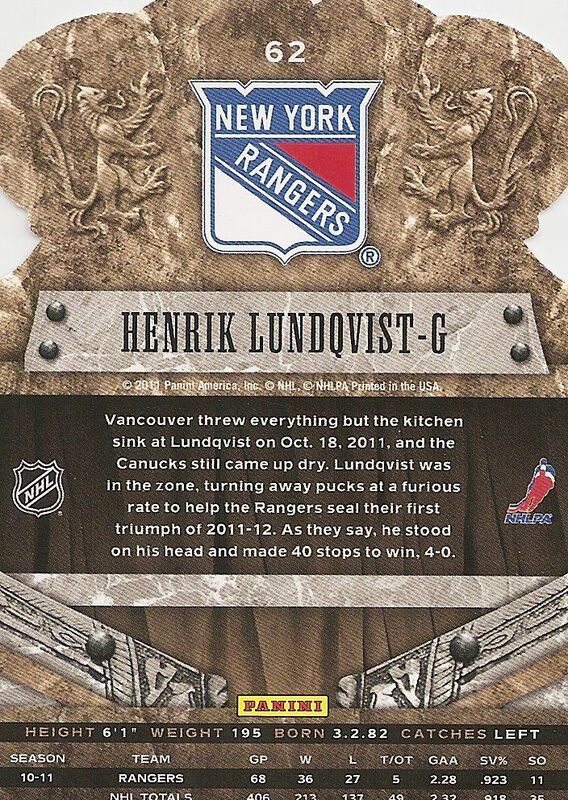 The other is the large '2011-2012' dates on the sides of the card. In scans these looked pretty hideous, but in person they're not as bad... still a bit too large for my taste. The back of the base cards look appropriate for what they are. The graphics follow the same themes as the front of the card. The backs give collector's a paragraph of information to read about the player and show the player's 10/11 stats. 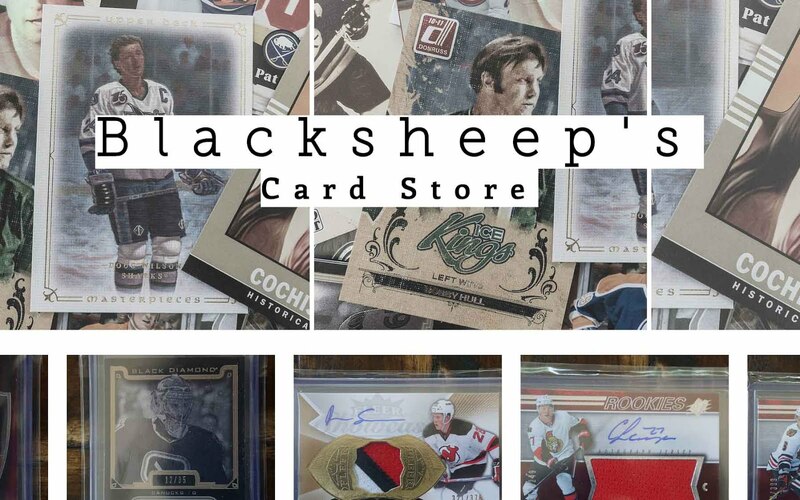 As with many other Panini products, the company pays tribute to some former NHL greats by adding them to their own subset. These cards are identical to the standard base cards except in a couple areas. The most obvious is the use of a black and white photo of the player. The second is in the large dates on the side fo the card. Instead of showing the current 11/12 release year, the dates have been changed to show the span of year's that the legend played from. Rookie cards make their way into the main set of Crown Royale in three tiers. The first tier is the standard Rookie Royalty card. These cards have only one difference between them and the standard base card - the foil. Instead of silver foil, the rookies get a light blue foil. The next tier of rookie card are the Rookie Royalty Signature cards. These cards feature an on-card signature of the rookie. Surprisingly, neither the Rookie Royalty nor the Rookie Royalty Signatures have serial numbering. The only numbered cards you will find in the main set are the fabulous Rookie Silhouettes Signature Prime Materials cards. 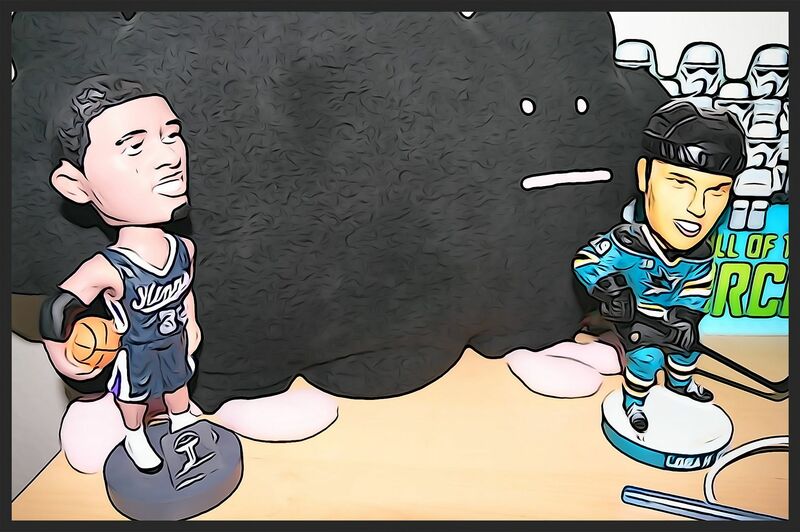 Each of those features a die-cut of the rookie over a large piece of the player's jersey. These cards are numbered to 99. They were a huge hit last year and should be again this year. Some have had complaints that parts of the game-used piece is covered up by the player die-cut, but that hasn't affected most collector's enjoyment of the card. Each box of Crown Royale comes with four packs. In each of the four packs collectors can find one memorabilia or autograph. Though in some breaks I've seen a few packs that had two hits in them.... lucky! On average though, collectors can expect to receive about 2 autos and 2 game-used cards per box. All of the inserts in Crown Royale will have some sort of royally themed design. 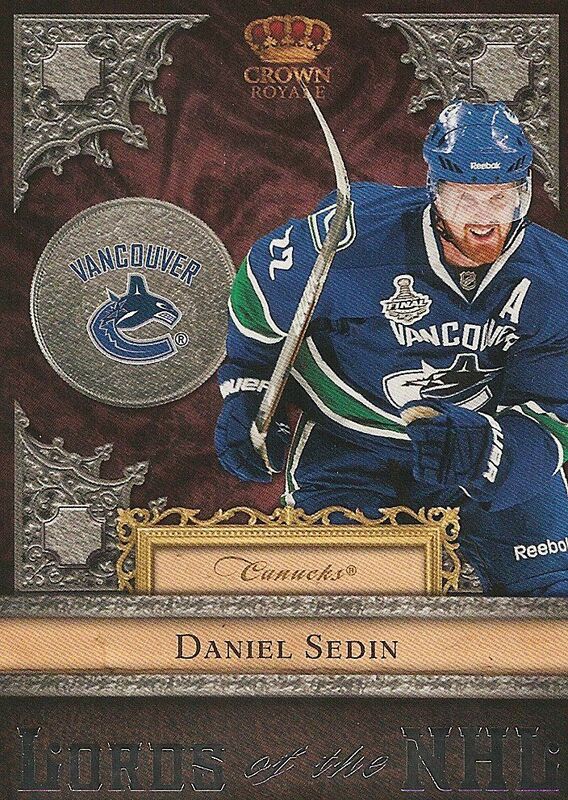 The Lords of the NHL card of Daniel Sedin shown above is very typical of what you'll get. Everything about the card design is based on medieval concepts - all the way from the ornate graphics to the fonts used on the card. Everything about these cards is over-the-top, but in a very good way. The designers at Panini just went all out and it worked out beautifully. Many of the game-used cards found in Crown Royale will feature single jersey swatches. This All the King's Men card gives you the single swatch in the shape of a shield. Having unique shapes is nice, but it doesn't make up for the fact that the jersey piece is so small. For such an expensive product, it would have been nice to have a more premium sized chunk of jersey. I guess in this kingdom, the king was a little thrifty. 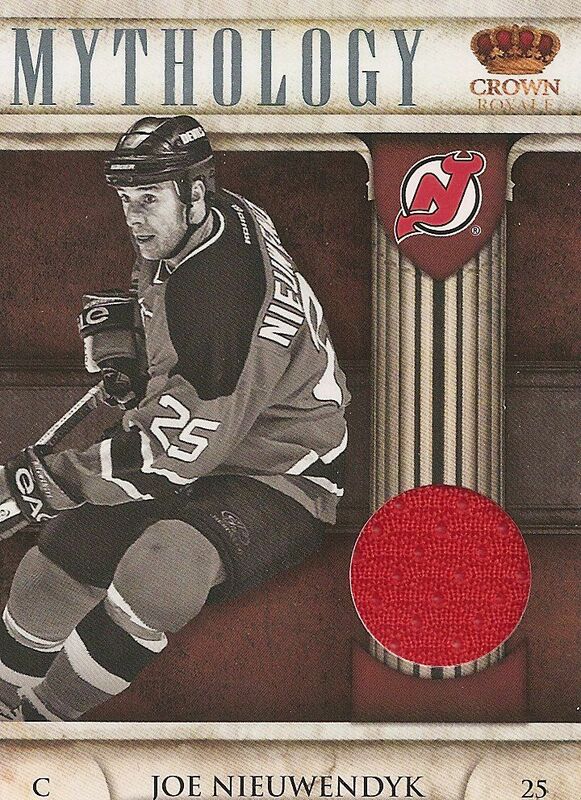 Above is another example of a small jersey swatch on the card. This time though, the design element matches my feeling on the small jersey piece. In the All the King's Men insert, the shield shape made sense and looked pretty good. In this case the jersey floating in the middle of the card doesn't make a whole of design sense. It feels as if there just needed to be a spot for a value-added component (the jersey) so they just put it there with little to no thought. Both jersey cards shown above do not feature any serial numbering. Some of the autographed inserts you can find in Crown Royale this year are the Scratching the Surface cards (cards that feature the signature of the player on a faux ice rink), Voices of the Game (autographs of famous hockey broadcasters), insert set auto parallels, and Premier Date base card autographs. 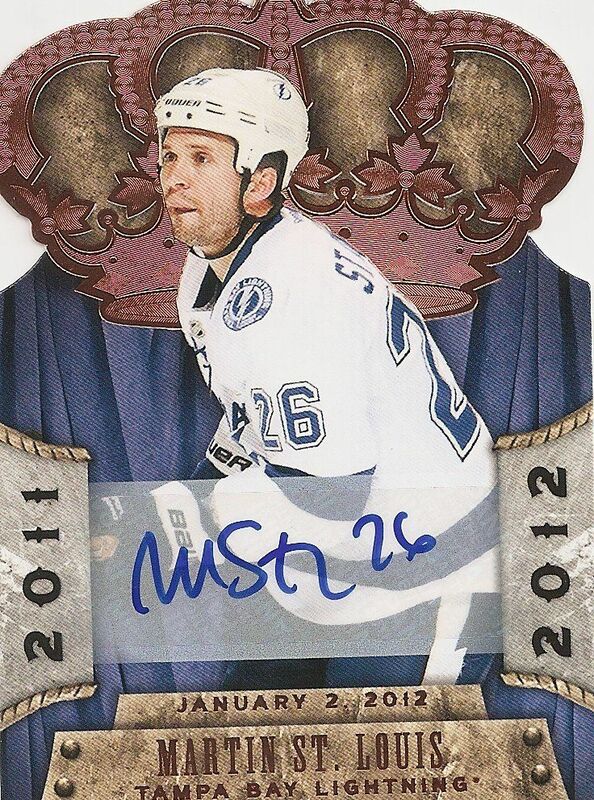 The Premier Date autograph of Martin St. Louis shown above is a sticker autograph numbered to 99. In the box I opened at my local hobby store it was the only serial numbered card I received. 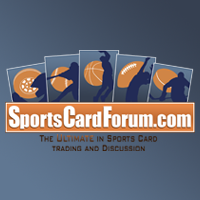 Panini decided to cut down heavily on the number of parallel cards offered this year within Crown Royale. This year the only parallel (besides auto parallels) to find are the red foil versions of the base cards. The red foiling looks great on the card, but unfortunately none of these cards are numbered. You can find other unique inserts sets within Crown Royale such as the hard-to-get Crown Jewels, non-rookie Silhouette Signatures, and recurring Private Signings cards. Crown Royale is a very likable product. It's quirkiness is what makes it so great. 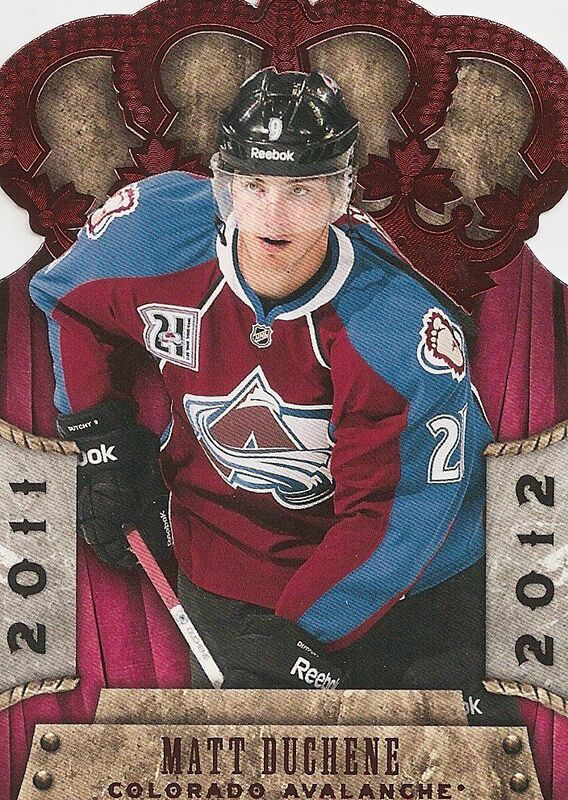 The design of the product is very fun and there is absolutely nothing else like it in the hockey card market. In terms of collectibility, the number one top draw will definitely be the Rookie Silhouette cards. These cards are beautifully designed and desired by many. These cards are also very difficult to get. In watching cases of this product get opened, the Silhouette card seems to fall about one per case of 12 boxes. Would I recommend this product? Well, I would have to say... maybe. It really depends on what you are after when making this purchase. For those who love unique cards, this is a definite buy. For those looking to flip cards for sale, I would stay away. Many of the boxes I've seen opened do not yield anything close to the original purchase price. So many boxes opened were a few (scrub) rookie autographs and a couple jersey cards. If you just want the big prize of the Silhouette, be prepared to make a pretty big gamble. Seeing as there are 12 boxes per case, hitting the Silhouette in one or two or even three boxes is a pretty tough proposition. That being said, Crown Royale is still a very solid product for collectors who want to add cool looking cards to their collections. I would definitely try a few boxes to see if I could hit a Silhouette, but not put too much more into it after that. Here I am at D & P Cards in Sacramento, CA breaking my box of 11/12 Crown Royale. While I think last year's Crown Royale seemed to deliver more in terms of value, I still think that this year's CR is a very nice product. It took me a while to get used to them, but the Rookie Silhouettes are quite possibly the best looking cards I've ever seen. I don't really think the rest of the product is that nice looking, it's a bit too dark for my liking. However, the Rookie Sil's and the new addition of the Veteran Sil's make this product what it is. I think Crown Royale has done really well this year and always a great product. hey luke, i love reading your reviews. i personaly think that panini didnt put much of an effort into this product this year. the cards look graight but not worth very much, and have no numbering on most of the cards. personaly i think last years crown was way better and more bang for your buck.without the siluets as chase cards this product wouldnt sell in my opinion. thank you for yet another contest and review. Well personally i love this years crown. My opinon may be a little biased though because i pulled a 1/1 datysuk auto in my box :). But i really love the design of the cards this year, if i had one issue about the product its the non-numbering the fact that nearly none of the parallels and jerseys have numbering takes away from the product. In my opinon its something that a mid-high end product like crown is should have for sure. Thanks for the contest, and great review as usual. I really appreciate your witty opening review lines. The king's speech is key! I'm looking forward to busting 2 boxes after I come home from my vacation to Cuba in March! This years Crown Royale looks great! I love the design of all the sets,from what iv seen though its pretty hard to pull something really good. The only thing I don't like about crown this year is that hardly any of the cards are numbered. Out of the box I got I only got one numbered card which was pretty odd. Overall though I love the look of crown royale and will be buying another box in the near future! I think that Crown, Pinnacle and Certified all took a big step back this year. Last year the inserts and parallels were numbered in Crown. the jerseys were numbered in pinnacle and the hotbox cards were numbered in certified. That at least gave them some semblance of scarcity. This year the inserts and non-numbered jersey are basically worthless. And to top it off, Limited went way uphill over last year and to charge the same for Crown Royale as Limited is a huge disservice. youtube username: aronowm2 please give me a sub! I really like Crown Royale this year. It looks great, but the jersey cards are really sloppy. I think the product is pretty hit, or miss... You can get an awesome patch, or a bunch of jerseys and a decent auto. The silhouettes are really what everyone is looking for, i think they deserve the attention, they are truly amazing looking cards. I thought I looked really good this year but I thought it kinda sucked that almost nothing was numbered. Crown Royale is just as excellent as last year's. Not much has changed, but not much needed to. The base cards are stunning, the inserts/autos/mem cards are stellar, and the usual Panini fun: The Voices of the Game autos. I love how they include the other people in the sport. Pinnacle with fans, Zenith with coaches, and Crown with Play-by-play guys. I wish I could bust this, but sadly, no money, and no cards to chase (well.. maybe the Voices of the Game of John Shorthouse) means I won't be busting much Crown. Definitely great looking cards, for the most part. The mythology jersey pieces are tiny though, and the fact that most cards aren't numbered is a draw back. I would still buy a box though, it's a solid product overall. I think I like Artifacts better though for a comparable product. I am still on the fence as to interpret how this product differs from last year. I am a fan that Panini decided to keep many of its subsets around and only amplify them with die-cuts or more game used. Yet, my last point is also a mark against Panini this year. It seems as if they have consolidated too much of their prime material for other product and left Crown Royale with bland jerseys and miniscule swatches. I can live with the sticker autographs of vets and on-card rookies this year. I liek the look as always of the cards. But I am not a fan of the 2011-2012. I think they just did it to fill space, and it makes the base and other subsets too busy, in my opinion. This is still one of Panini's best products of the year. I will be buying a box for sure, but how much I will buy, we will see. Not as strong hit wise as you would expect from a box at this price point, but it's a fun rip with a hit per pack, which is great for some kid collectors who want a hit. I'm on the fence about picking up a hobby box of Crown; the cards look enticing but I'm with you on the bland jerseys and swatches - from what I've seen from your break. I'm have to weigh in on purchasing a box or not, best of luck on your next box. It looks like a pretty nice product this year. I did not see many breaks of last year's stuff so I cant really compare to last years product. I am thinking about getting a box of this stuff maybe. This product looks great, but for me I do not think it is a product that I would pick up. The bang for the buck isn't necessarily what I would be looking for as just a kid in high school with no job :P Agreeing with you , I am not a big fan of the jersey cards. The designs are fantastic but it seems that they "cheaped out" a little bit. I think that crown royale is a very nice looking product. But, I don't like that almost none of the cards are not numbered. It looks better than last year. It's a cheap product with alot of nice looking cards. I have never tried Crown Royale before but it seems to be a solid product. I think the reason why there wasn't much numbering on the cards was because of the complaints Panini received from too many parallels for collector's to chase in "Certified." That's just my thought on it though. The base cards this year don't look as good as last years. 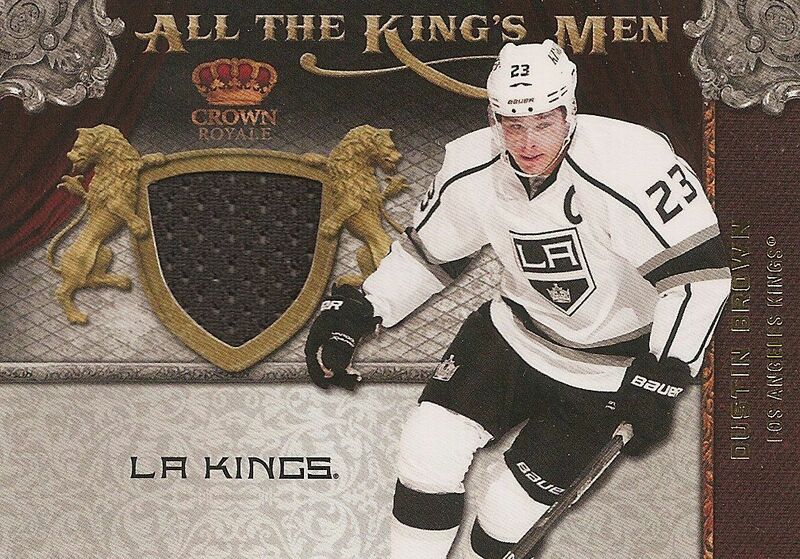 All The Kings Men jersey cards are actually pretty nice but the Mythology jerseys are just meh. I would have to agree that it doesn't bring much value back for $100+. I would rather buy a box of Artifacts than Crown Royale. Still there are the amazing silhouette cards that stand out compared to any other products out there. Overall, I would rate this product a 7.5/10. shockingly I would say I dislike this years crown. If you look at last year there were many different parallels plus many numbered cards. I am very disappointed that only a few cards are numbered this year. The parallels aren't even numbered which surprises me. I also dislike this years crown because it looks similiar to last years. the scratching the surface autos and the base. I wanted to buy a box last year so badly that i told myself i will have to buy a box this year because the product did so well last year, but now when i think about crown i am disaapointed. Overall i rate crown 6/10. Don't get me wrong, there are some nice and sick cards you can pull, but the odds are pretty tough. I busted a box yesterday and enjoy the cards, but not at the current price point. Two small white swatch jersey cards, a sticker auto, and a no name RC auto. If this product was in the $70-$80 range I'd buy more, but not at $110+. The lack of parallels (can't believe I'm saying this about Panini) and numbering hurt the value of Crown Royale this year. This is the first Panini box I've busted, and I don't see myself busting any in the future. I'll just pick up the single I want from their releases and call it a day. Great review once again. I will definitely try my luck with at least one box hoping to get a Coho RC. I like the looking of the cards, but I don't like the fact that the majority of them are not numbered. Also, for the price, I don't really agree. That's really non value, but for a group break (case), that's really a nice product. For around 45$ for one team, it's really good. I think that Panini should be very proud of the product they've put out. Crown Royale has some of the nicest base cards that have come out this year. I don't however enjoy the foil they used for the names, it's really hard to see. I think that numbering the rookie cards, the legends and the reds would have been good. I also wish that the inserts and normal jerseys would be numbered. I really like the design though. 2nd best product that has come out thus far. Really like product, wish they numbered more inserts and for a product like this, more on-card autos. Emphasized too much on silhouettes. Should have just limited them to the rookies. CONTEST IS NOW CLOSED! Thanks to all who participated!